(APN) DECATUR — In a packed courtroom, former DeKalb County police officer Robert Olsen, claimed self-defense in the 2015 shooting death of Anthony Hill, an unarmed and naked, mentally ill man who Olsen shot and killed. The two-day immunity hearing for Olsen concluded on Tuesday, May 22, 2018 in DeKalb County Superior Court with Judge J.P. Boulee presiding. Judge Boulee will give his decision in about three weeks as to whether Olsen will stand trial for felony murder in the death of Hill. Olsen said he believed that Hill experienced what he characterized as “excited delirium,” a defense that police officers frequently use in questionable deaths or cases of excessive use of force resulting in death. Some officials claim it is a rare neurological condition that turns normally peaceful individuals into raging, violent attackers. Olsen testified that his training taught him that people who take their clothes off are exhibiting symptoms of “excited delirium,” possibly influenced from taking drugs like PCP. He said he was told that excited delirium can cause an individual to have superhuman power and be impervious to pain. Anthony Hill was an Afghanistan veteran who suffered from post traumatic stress disorder (PTSD) and bipolar disorder. Hill was having a mental health crisis, because he was not taking his prescription drug for bipolar disorder, on the day he died. He was walking around his Chamblee apartment complex naked asking for help. Several residents interacted with him without incident. Three people called the police to report a naked man acting unusual. Olsen, the first officer on the scene, said he saw Hill sitting in the middle of the street naked about 150 feet away. Hill stood up and ran toward Olsen. Olsen looked down to unlock a difficult car door and when he looked up again Hill was about ten feet away from the front of his car, Olsen said. “I only had five seconds to respond,” Olsen testified. He got out of the car, gun in hand; walked backward a few steps; shouted “Stop, Stop,” and immediately shot Hill twice in the chest. Lane Cross, the District Attorney, reported that Hill thought of the police as his friends and was probably running to Officer Olsen for help. Olsen testified that he was scared and feared for his life and that he followed police procedure and aimed at the center mass of Hill’s body to stop the threat. “The threat to me was his superhuman strength and he did not stop when I told him to stop,” Olsen testified. Olsen is 6’2″ and about 210 pounds with all his equipment on including spray, a Taser, and a baton. Hill was 5’9″ tall, about 165 pounds, and naked. The second police officer on the scene, L. Anderson, testified that Olsen said Hill was beating him on the chest with both hands and he feared for his life. Part of a video was shown in court that appears to show Olsen demonstrating to Officer Anderson how Hill hit him. Anderson’s statements and the video–which both show that Olsen at the time claimed that Hill hit him–contradict Olsen’s statements now that he shot Hill while Hill was running towards him. But Olsen testified that he does not remember telling Anderson that Hill hit him. None of the eyewitnesses saw Hill hit Olsen. In fact, it seems that Hill never got close enough to hit Olsen. Officer Anderson testified that he would have used other options to bring Hill under control. Greg Webb, a DeKalb police instructor, said officers are trained to de-escalate situations. Webb said he would have waited for backup and assessed the threat before taking action. Hill was not aggressive, threatening, or hit anyone. He was only running through the apartment complex confused and naked, asking for help. Dr. Darrell Ross, an expert witness on use of force, testified about excited delirium and concluded that the incident happened so fast that Olsen had no time to use his spray, taser, or baton; and that shooting Hill was his only option. But some national experts question whether excited delirium is a real phenomenon or whether it is as widespread as police say. “Police and medical examiners are using ‘excited delirium’ as a means of whitewashing what may be excessive use of force and inappropriate use of control techniques by officers during an arrest,” Eric Balaban, senior counsel with the American Civil Liberties Union National Prison Project, told National Public Radio. Hill’s mother, Carolyn Giummo, said she wanted to hear the truth, but did not hear it today. “I saw the truth on the video which does not lie,” Giummo said. “He (Olsen) lied as he has lied from day one, this was an assassination in cold blood. There are a lot of great officers out here, but he is an embarrassment to the badge,” Chris Chestnut, an attorney for Hill’s family, said outside the courthouse. “He was a ticking time bomb; he had a preexisting pattern of anger management, aggression, and inability to handle the responsibilities of being a police officer. He was supposed to get counseling, but did not receive any counseling and that is to Anthony’s determent,” Chestnut said. “There are so many other options instead of shooting as a first option. I believe Brown and Black bodies are under attack in this country,” Dawn O’Neil with Black Lives Matter Atlanta said. “He had a Taser and C.O. spray, but he choose to use his gun. Training plays a factor because officers are trained in what I call ‘shoot to kill,’ and everyone they encounter is not the enemy,” Keisha Braswell with Alliance for Black Lives said. 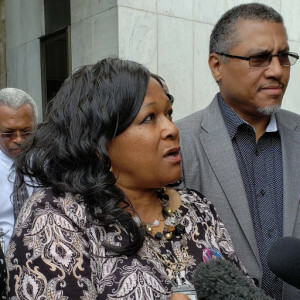 “I think you can disable an individual with less than lethal force by shooting at the extremities, but they are trained to shoot center mass to drop the target and that is a problem,” Gerald Griggs, Vice President of the Atlanta chapter of the National Association for the Advancement of Colored People, told Atlanta Progressive News. “We need Obama’s 21st Century Police Initiative that outlined different nonlethal steps that officers can take… so we can avoid incidents like what happened to Anthony Hill,” Griggs said. In 2009, a taxi driver called 911 to report Olsen’s threatening behavior and told investigators in a written statement that it won’t be long before Olsen shoots someone, the Atlanta Journal-Constitution newspaper reported in 2016. In 2012, Olsen took a man to jail for a brake light violation and for having a Puerto Rico driver’s license, even though that is a legal form of identification in the U.S, according to a source familiar with the matter. Numerous complaints have been filed against Olsen for rude, aggressive behavior; and the use of profanity toward citizens for minor violations. the legal hearing was scheduled for May 23 but it was bumped to May 22 possibly to avoid a morning and lunch protest that was also scheduled to draw dozens opposed to police free fire tactics. There is Crisis Intervention Training for some police that is supposed to prevent use of guns and focus on talking people out of rough situations. This police officer is a Domestic Terrorist! What is going on with the Olsen case. Was there a decision by Judge Boulee on the Immunity hearing? Has a trial l date been set yet?